Where to Go Next Thumbnail picture: Melbourne City. Lots of full size pictures below. Melbourne (pictured) is a large city of 4 million people and the capital of the state of Victoria. The city's wealth dates back from the 1860 to 1890 gold rush. Melbourne residents regard their city as the country's most elegant and cultured yet modern city. It's many old majestic buildings, museums and galleries are intermingled among the glass skyscrapers. Melbourne has a distinctly European feel with wide tree-lined boulevards. The city centre is surrounded by parkland and despite its sometimes cool climate Melbourne has a vibrant outdoor cafe culture. 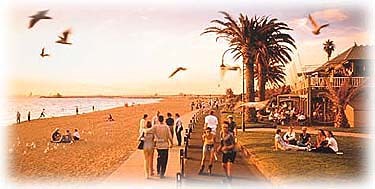 On warm summer nights many people go to the trendy beachside suburb of St Kilda. There is a strong emphasis on the arts. A large portion of Melbourne's residents were born overseas and immigrated giving the city a multicultural mix with a rich diversity of restaurant cuisines and ethnic festivals. Melbourne also has a powerful annual line up of major sporting events including the Australian tennis open, both the car and motorcycle Australian Formula One grand prix, the Australian Rules Football grand final and internationally renowned horse races during the Spring Racing Carnival, the biggest race being the Melbourne Cup. In March 2005 Melbourne will host the Commonwealth Games. Although Melbourne is set on a large and somewhat picturesque bay, Victoria's best natural beauty is further afield. The 300 kilometre long Great Ocean Road in southwest Victoria is one the world's great coastal drives. Melbourne city centre can be explored in a day by walking. It is worth catching the famous Melbourne tram even if just for one block to save on the walking. The eastern half of the city is much more interesting than the western half. 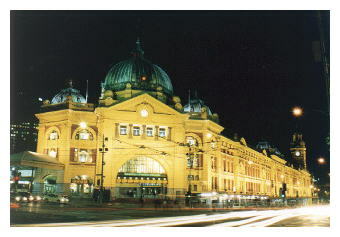 Flinders Street Railway Station (pictured) is Melbourne's main metropolitan train station and was built in 1900. Its gold and red facade makes it easy to spot. The main entrance is at the corner of Flinders Street and Swanston Street. St Paul's Cathedral is Melbourne's neo-gothic Anglican Cathedral Located on the corner of Flinders street and Swanston Street..
Federation Square is a modern architectually renowned plaza and buildings. The complex is a bit of a maze and things are hard to find. The official government information centre is one of the buildings and housed in another building there is the Ian Potter Centre which is part of the National Gallery of Victoria and houses what is without doubt the finest collection of early Australian paintings. Entry is free except to special exhibits. Old Treasury Building is next door and faces down Collins Street. It houses a history museum explaining Victoria's gold rush period.. Behind Parliament is St Patrick's Cathedral, Melbourne's Catholic Cathedral. Corner of Gisborne St and Albert St, East Melbourne. Collins Street is Melbourne's most exclusive street lined with expensive jewellers and clothes shops still in their original double story nineteenth century shops. Between them are the glass skyscrapers of modern Melbourne. 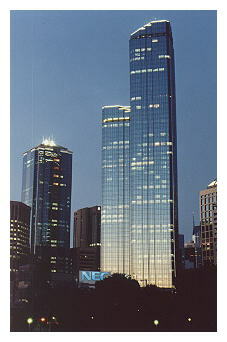 The 253 metre Rialto Towers (pictured) at 525 Collins St is the tallest building in the southern hemisphere. From the Rialto Observation Deck on the top floor it is possible to see as far as the narrow entrance to the enormous Port Phillip Bay upon which Melbourne is built. 525 Collins Street (corner of King Street). Next to the Rialto are the elaborate nineteenth century Olderfleet Buildings. Chinatown on Little Bourke Street (between Swanston Street and Exhibition Street) is lined with mostly Chinese restaurants for two whole city blocks. Bourke Street shopping mall (Between Swanston Street and Elizabeth Street) has among its shops the two big department stores Myers and the more up market David Jones. The old neo-gothic General Post Office designating the centre of Melbourne is also in the mall and is now houses boutique clothes shops. The post office is now on Bourke Street just 50 metres up the hill. Queen Victoria Market at the northern end of Melbourne city centre is large bustling and full of character. It has eastern European style delicatessens, butchers, fruit and vegetable grocers, clothes stalls, cheap watch and toy and souvenir sellers. It is well worth visiting. Opening hours are limited so check. Corner of Victoria Street and Queen Street. Map reference E4. Get there by catching any northbound Elizabeth Street tram and get off at Victoria Street. Victoria's State Library boasts over one million books. Swanston Street (corner of Latrobe Street). 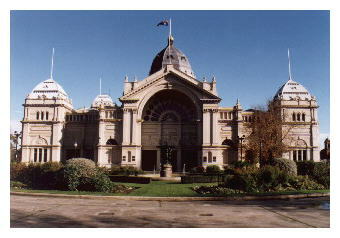 The Old Exhibition Building (pictured) in the quiet Carlton Gardens at the north end of Exhibition Street has a magnificent exterior. Map reference N2. Getting there: take any eastbound Bourke Street tram and get off at the corner of Nicholson Street and Gertrude Street. It was constructed for Australia's Centenary celebrations in 1888commemorating 100 years since first European settlement in Australia. The parliament of Australia sat here from the time of independence and Federation of the seven Australian colonies from Britain in 1901 until 1927 when the capital moved to newly purpose built city of Canberra. The brand new Museum of Victoria is behind the Old Exhibition Building also in Carlton Gardens. It has lots of large open spaces and not very many interesting exhibits. The gruesome Old Melbourne Gaol is at the north end of Russell Street (near Victoria Street). Australia's most notorious bushranger, Ned Kelly, was hanged here in the 1850s. Bushrangers often held up and robbed stage coaches travelling in the country side in the early pioneering days of Australia. Map reference J4. Open daily 9.30am to 4.30pm except Good Friday and Christmas Day. Allow one hour to visit. Entry: adults $8, children $5, students $6. Melbourne Aquarium is on the edge of Yarra River next to King Street under the railway overpass. Just south of the city centre over the Yarra River is the new arts precinct of South Bank. Just over the Swanston Street bridge onto St Kilda Road is the Melbourne Concert Hall. 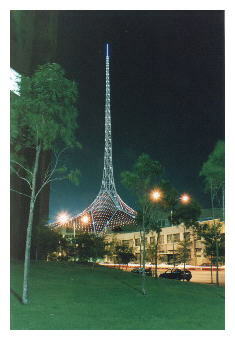 Next door is the State Theatre and its spire (pictured) which has become a symbol of Melbourne. The imposing rectangular stone building with the moat next along is the National Gallery of Victoria. 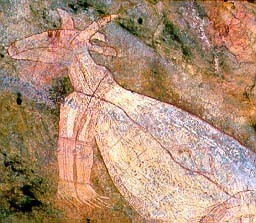 It houses a collection of historical and contemporary international art. The asian collection is particularly good. The excellent Australian collection is not in this building. It is in the Ian Potter Centre at Federation Square on the city side of the river. South Gate Complex of classy shops and restaurants overlooking the Yarra River is a popular and pleasant place to have lunch or dinner on a warm day. Situated next to the Melbourne Concert Hall..
Crown Casino and Entertainment Complex (pictured) is a mammoth construction recently built at a cost $2 billion. It is on the riverside further west from South Gate. It reputedly has more gaming tables than any other casino in the world . As well as the Casino there are many exclusive clothes shops and popular riverside restaurants, a cinema, nightclubs, bars and two hotels. On Friday and Saturday nights it is extremely crowded. At night on each hour the flame towers release huge bursts of flame. The casino also has the world's biggest chandelier in the foyer and there is a light and sound show there each hour on the hour. Carparking $5 to $10. Melbourne city centre is almost surrounded by English style parks and gardens with large lawns. Do not expect to see much native Australian vegetation. King's Domain and the Royal Botanical Gardens are to the south of the city centre across the Yarra River. Also in King's Domain is the Shrine of Remembrance, a memorial to Australia's war dead. This dominating shrine is visible the whole length of Swanston Street in the city. Getting there: Catch any Swanston Street tram south except the number 1. To the east are the Treasury Gardens and the Fitzroy Gardens. 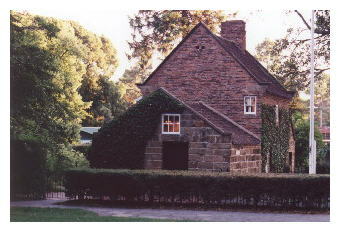 Captain Cook's Cottage (pictured) has been reassembled in Fitzroy Gardens. Captain Cook was the first Englishman to sail along and chart the east coast of Australia in 1770. He is generally celebrated for having discovered Australia but this is not historically accurate. Dutchman Abel Tasman naviagted Australia's south coast some years before. The Australian state of Tasmania is named in his honour. To the north of the city are Flagstaff Gardens and Carlton Gardens where the old exhibition building and new museum are..
Melbourne Zoo owns three zoos. All zoos are open 9am to 5pm every day of the year. Adult entry is $20. Werribee Open Range Zoo is 30 kilometres southwest of Melbourne and has Australian and overseas wildlife. The last safari tour leaves at 3.30pm. http://www.zoo.org.au/visiting.cfm?zoo_id=3 Nearby is the historic Werribee Park Mansion which charges separate admission. There is no public transport to Werribee Park Zoo. Take the freeway towards Geelong and exit at Werribee South to K Road. This beachside suburb of St Kilda lies 7km south of the city and is easily accessible by regular tram services from the city. On warm summer weekends Melburnian's flock to the outdoor cafes (on Fitzroy Street, Acland Street and facing the beach) and stroll, cycle or rollerblade along the beachside. Bike and rollerblade hire is available next to St Kilda Pier. On Sunday there is a craft market on the Upper Esplanade. Luna Park is an old run down rollercoaster and amusement park at the corner of Acland Street and Carlisle Street. Its other claim to fame is the mouth people walk through to enter the park which is usually under scaffolding being repaired. St Kilda's restaurants and pubs are also a popular nightspots with the young. Though a seedy redlight district, the influx of bohemian arty types and more recently the arrival of wealthier yuppies has made St Kilda an "in place" but some remnants of the past remain especially on Grey Street and Carlisle Street. Getting there: Catch a 5 or 16 tram south down Swanston Street and St Kilda Road then along Fitzroy Street to the beach. Or catch a 96 lightrail west along Bourke Street, south onto Spencer Street, onto an old railway line then west along Fitzroy Street to the beach. Or catch a 10 or 12 tram west along Collins Street, south onto Spencer Street, through South Melbourne and terminating in St Kilda at the corner of Park Street and Fitzroy Street. Chapel Street in South Yarra, some 4km south of the city has a long strip of classy fashion shops, restaurants, pubs and nightclubs for Melbourne's young hip crowd. On Friday and Saturday nights Chapel St traffic is bumper to bumper with car stereos blaring at full volume. The action overflows onto the cross street Toorak Road which is generally more upmarket. Another cross street, Commercial Road, is a gay strip. The further south you go along Chapel street into the next suburb of Prahran the cheaper and less upmarket things get. Greville Street in Prahran (off Chapel Street) is a retro culture strip. Getting there: Catch a Sandringham, Pakenham, Cranbourne, Dandenong or Frankston line train to South Yarra station on Toorak Road. Trams south from Swanston Street and along St Kilda Road are the 8 which turns onto Domain road and Toorak Road and the 72 which turns down Commercial Road. Sandringham trains go to Prahran station on Greville Street. The 78 and 79 trams run along Chapel Street. The historic mansion Como House is also in South Yarra. See entry under Historic Mansions below. Melbourne is the mecca of Australian Rules Football. The whole city is mad about the game. The season runs during winter with finals in September. Try to make it to a big game at the Melbourne Cricket Ground (MCG) or Docklands Stadium Entry is adults $14, children $7. Finals cost more. The MCG is one kilometre east of the city. Either walk from the city, catch a a train to Jolimont or Richmond or catch a number 75 or 48 tram to Jolimont. Docklands Stadium is accessable from Spencer Street Station over a pedestrian bridge. Many Melbourians enjoy cycling along the beach from St Kilda south to Brighton and north to Port Melbourne. Bike hire available from a van that parks at St Kilda Pier. A shop on the less crowded north side of Fitzroy Street near the beach hires out roller blades. A second best, but still popular option, is east along the Yarra River from south bank. Bike hire is available on the riverside from a shipping container between the Swanston Street Bridge and the rowing clubs. 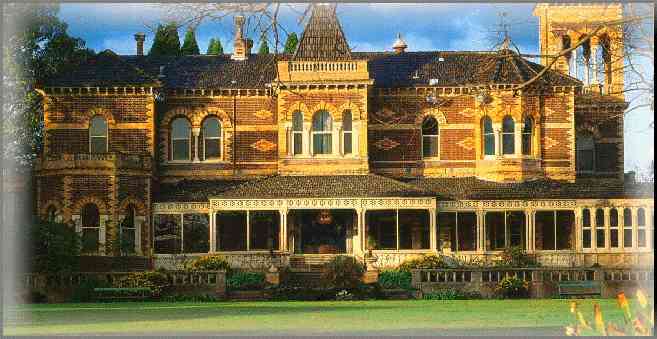 Rippon Lea House (pictured below) in Elsternwick 10 kilometres south of the city is set in large gardens and maintained by the National Trust. Open 10am to 5pm. Closed Mondays, Good Friday and Christmas Day. Open other public holidays even if they fall on a Monday. Adults $9, Children $5, Students $6. Getting there: Catch a Sandringham train south to Ripponlea, walk east along Glen Eira Road through the shops then turn right into Hotham Street. The walk takes 10 minutes. Como House in South Yarra also is also set in large gardens and maintained by the National Trust. 5km east of the city. A few minutes walk from the nearest tram stop. Alternatively catch the 220 bus from the city which runs past the entrance. The Australian Formula One Grand Prix for cars is run in early March each year around the lake in Albert Park some 3km south of the city. The Australian Formula One Motorcycle Grand Prix is run at Philip Island near Melbourne. City Explorer Bus Cost: Phone (03) 96501511. 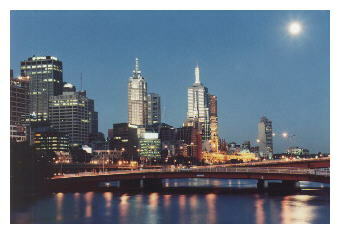 Melbourne is a large city with accommodation in many of its numerous suburbs. This guide will only list backpackers accommodation in the fun suburbs with active nightlife. Expect to pay around $25 to $28 for a bed in a dorm and $60 to $80 for a double or twin room in a backpcakers hostel. Rather than a backpackers hostel, backpackers wanting double or twin rooms might also consider the budget hotels on Spencer Street in the city centre and on Barkly Street or Acland Street in St Kilda. Alternatively this site also provides links to the homepages of the major hotel chains. Prices can rise by 50% during the Formula 1 Grand Prix in early March each year. We expect that prices will also rise during the Commonwealth Games in 2006. Most city centre youth hostels are on Elizabeth Street. All Nations Backpackers Hotel is cheap and has a bar. 2 Spencer Street, Melbourne (corner of Flinders Street). Phone 1800 222 238. Toad Hall is quiet . 441 Elizabeth Street, Melbourne. Phone 03 9600 9010. Car parking $5. Exford Hotel Backpackers is upstairs in an old pub. 199 Russell Street, Melbourne. Dorm $24 to $27, twin or double room $66. Phone 03 9663 2697. City Centre Backpackers 475 Spencer Street Melbourne. Phone 03 9328 5888. Dorm $35, twin room $50, double room $75 to $90. City Centre Private Hotel 22 Little Collins Street, Melbourne. Phone 03 9654 5401. Kitchen, TV lounge. Backpackers City Inn is upstairs in an old pub. 197 Bourke Street, Melbourne. Phone 03 9654 5401. Victoria Hall 380 Russell Street, Melbourne. Phone 03 9662 3888. North Melbourne is a quiet residential area just north of the city centre. The two YHA hostels are here. Bev and Micks Backpackers 312 Victoria Street (corner of Peel Street), North Melbourne. Phone 03 9329 7156. City Scene Backpackers 361 Queensberry Street, North Melbourne. Phone 03 9348 9525. Global Backpackers 238 Victoria Street (corner of Elizabeth Street), North Melbourne is small hostel that has had bad reviews about cleanliness and security. Phone 03 9328 3728. 4 bed dorms, singles, twins and doubles at competitive rates. Coffee Palace Backpackers 24 Grey Street, St Kilda (just off Fitzroy Street). Phone 1800 654098. Dorm $19 to $24, twin/double $60. Kitchen, café, tour booking office. Olembria Guesthouse has excellent facilities. 96 Barkly St. Phone 03 9537 1412. Lounge, dining room, courtyard, parking. Book ahead. Ritz For Backpackers is comfortable and upstairs from the very popular and large Elephant & Wheelbarrow English-style pub. 169 Fitzroy Street (corner Princes Street), St Kilda. Phone 03 9525 3501. Dorm bed $23 to $26, twin or double room $60 to $65. Kitchen, lounge. Base Backpackers 17 Carlisle Street, St Kilda. Dorm $24 to $28, double or twin $95. All Nations Motel 32 Carlisle Street, St Kilda. Phone 03 9534 0300 or freecall 1800 008 718. Dorm $20 to $25, double or twin $80. Pint on Punt 42 Punt Road, Windsor. Phone 1800 835 000. In a renovated pub. Dorm $25, double or twin $60. Oslo Hotel 38 Grey Street, St Kilda. Eildon Mansion 51 Grey Street, St Kilda. The Hub Backpackers 70 Nicholson Street, Fitzroy. Phone 03 9419 4839. Hotel Claremont 189 Toorak Road, South Yarra. Phone 03 9826 8000 or freecall 1300 301 630. Dorm $30, single $66, double or twin $76. Click here for Melbourne Backpackers Hostel Directory (it contains just a listof the above hostels). Lunch time cafes and restaurants are everywhere in the city. Little Collins Street, Little Bourke Street and the stylish Hardware Lane (map reference G9) have many cafes and restaurants, though quite expensive. The small Greek Precinct is on Lonsdale Street between Swanston and Russell Streets. Map reference J7. Lygon Street in Carlton is lined with Italian restaurants and generally offer excellent value. Map reference K1. Brunswick Street in Fitzroy is popular for its "alternative" culture. Map reference Q1. Getting there: Catch an 11 tram west from Collins Street. This tram runs along Brunswick Street. Toorak Road and Chapel Street in South Yarra/Prahran and Fitzroy and Acland streets in St Kilda have modern international style restaurants with an Italian emphasis and are popular with young people. In South Yarra/Prahran try TGI Friday or Bennigans, both on Chapel Street. In St Kilda try Monroe's on Fitzroy Street or the Stokehouse on the beach. 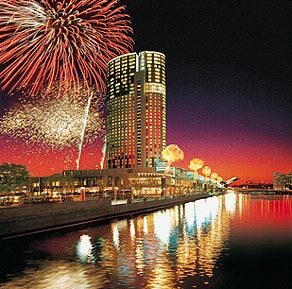 There are many restaurants with a variety of cuisines overlooking the Yarra River from the south bank at the Crown Casino Complex (map reference F16) and South Gate Complex (map reference K13). Most suburbs have at least one supermarket. For those wishing to cut costs and cook there own food Coles has a supermarket in the city on the corner of Elizabeth and Flinders Streets (map reference J12). Acland Street in St Kilda has two Supermarkets, Coles and Safeway. There are 3 supermarkets in Prahran but two are in back streets. Coles however faces onto Chapel Street. The Nightclub scene at the smaller venues moves quickly so get up to date information in one of the club magazines available free around town at restaurants and cafes catering for a young crowd. The bigger nightclubs with more stable popularity are listed below. Entry is generally $10 to $15. Queues can get long around midnight. Clubs have dress codes and dressing better always helps get in. Metro, 60 Bourke Street, City. Huge commercial dance club with a small R&B dance floor too. Dress on Friday is classier than Saturday where unfaded blue jeans are acceptable, but like most places the better you dress the less problems you will have getting in. Map ref N7. Twister at the Palace, Lower Esplanade, St Kilda. Huge 80s music dancefloor and smaller techno dance floor and tiny R&B floor. Tacky decor and downmarket dress, though it is becoming slowly more dressy. Saturday is a bigger night than Friday. The formidably long queue moves quickly. The casino also has three nightclubs at its west end on the second floor that are reliably popular though each caters for different tastes. Heat is commercial dance for the stylishly dressed. No denim, guys wear a collared shirt. Odean is a little more relaxed both in the dress code, the music and the people there. Mercury Lounge often has live rock bands and blue jeans are fine. Avoid the King Street nightclubs in the city (and more generally; avoid King Street after midnight). Spy Lounge on King Street is popular especially on Saturday night and as far as King Street goes, respectable. Elephant and Wheelbarrow, Fitzroy Street (corner Princes St), St Kilda. Massive English pub with dance floor and band on Friday and Saturday night. Another Elephant and Whhelbarrow pub has open in the city (corner Exhibition and Bourke Streets). Although the city venue is a bit smaller it too is very popular. Bridie O'Reilly's, Chapel Street, South Yarra. Popular irish pub. Pugg Mahones Hardware Lane (between Lonsdale Street and Little Lonsdale Street, Melbourne. Popular irish pub. Esplanade Hotel Upper Esplanade St Kilda. Well known for hosting up and coming bands. Large place, a Melbourne institution, with down market crowd; wear a T-shirt and jeans. Often see paramedics parked outside and police interviewing patrons inside. There are a lot of popular pubs in Richmond (including the Great Britain on Church Street and the Swan at the corner of Church Street and Swan Street), and a few on Clarendon Street South Melbourne (map ref E17) and Chapel Street South Yarra/Prahran. There are a number of small pubs in Fitzroy catering to an alternative crowd. The Dan O'Connell on Brunswick Street is bigger and often has bands. There are dozens, perhaps one hundred, bars tucked away in the side streets and laneways in the city centre that are especially busy with the office crowd on Friday night. Try any bar on Little Collins Street or Flinders Lane or the alleyways off these streets. The concentration of bars is west of Elizabeth Street. Also try Hardware Lane. Chapel Street in South Yarra has numerous bars, mostly for classy people dressed in black, or more accurately pretending to be classy dressed in black. Greville Street in nearby Prahran also has some bars that are a bit more relaxed. Melbourne theatres include Regent, Princess and Her Majesty's in the east end of the city and the State Theatre on St Kilda Road at Southbank just over the river from the city. See map. Half Tix outlet for discount theatre tickets is in a booth on the Bourke Street Mall. There are many bars/restaurants around the theatres for pre-theatre meals provided you stay west of Swanston Street. Village, Hoyts and Greater Union each have old cinemas near the corner of Bourke Street and Russell Street. Newer cinemas that show the full range of new releases are Village at Crown Casino on Southbank and Village at the Jam Factory on Chapel Street in South Yarra. Art House cinemas include Cinema Nova on Lygon Street in Carlton, The George on Fitzroy Street in St Kilda, Kino in the basement of the twin office towers at the corner of Collins Street and Exhibition Street in the city. Bourke Street Mall has many clothes shops and two big department stores; Myers and the more upmarket David Jones. Collins Street has numerous expensive designer clothes shops. Melbourne Central is a shopping complex bounded by Swanston, Elizabeth, Latrobe and Lonsdale Streets with mainly clothes shops. Inside is the Daimaru department store and a large glass cone surrounding an old shot tower that the developers could not get permission to demolish. This is a sight in itself. Queen Victoria Market is one of Melbourne's top tourist attractions. At the northern end of the city centre this large bustling market is full of character. It has eastern European style delicatessens, butchers, fruit and vegetable grocers, cheap clothes stalls, cheap watch and toy and souvenir sellers. It is well worth visiting. It is generally more crowded in the mornings and stalls start to close just after lunch time. It is closed Wednesdays. Corner of Elizabeth Street and victoria Street. Map reference E4. Getting there: catch any north bound Elizabeth Street tram and get off at Victoria Street. Chapel Street in South Yarra/Prahran is lined with designer label shops catering for affluent young Melbournians. Chadstone Shopping Centre is a huge suburban shopping centre located on Dandenong Road 20 kilometres southeast of the city centre just before Warrigal Road. It has discount stores, department stores and designer label shops. It is not directly accessable by public transport from the city. Catch a train to Oakleigh and change to a bus to get there. Tullamarine Airport is Melbourne's main airport and has international and domestic connections. The airport is 22 kilometres northwest of the city and is only readily accessible by tollway. Either catch a taxi ($30) or the airport shuttle bus ($12) which drops you at the V-line bus station within the grounds of Spencer Street railway station. Taxis add an airport pick up fee and the toll to the metered fare. For timetables and prices either phone them or refer to their websites for a more competitive rate. Airfares are quoted exclusive of taxes which can add around $50 to a domestic flight and $150 to $200 to an international flight. Spencer Street Railway Station in the city has trains to regional Victoria, Adelaide and Sydney. The V-line bus station is also there and has services to southern New South Wales as well as a few other long distance buses operated by other bus companies. The two biggest and most well known Australian long distance bus companies, Greyhound Pioneer and McCaffertys operate out of their own bus station on Franklin Street (near the corner of Elizabeth Street) in the city. Buses are cheaper than trains and on long trips faster though less comfortable. Check their websites for routes and timetables. Both have tour offices on Swanston Street between Bourke Street and Lonsdale Street. A passenger and car ferry runs between Melbourne and Devonport in Tasmania overnight every night and also every day during summer. The ferry is operated by TT-Lines and leaves from Station Pier in Port Melbourne. The pier is accessible via tram from the city. Catch tram 109 west along Bourke Street then south into Spencer Street. The tram takes 25 minutes to get to the pier which is the terminus. Melbourne has trains, trams, lightrail and buses. Services generally radiate out from the city centre, so to travel across town it is often necessary to go into the city and out again. Buses operate mainly in the outer suburbs to take commuters to the train line. In the city centre and inner suburbs up to 7km out you will never have to walk far to train station or tram stop. Passengers must buy a Metcard ticket from a machine and then validate the ticket when commencing travel by inserting the ticket into another machine seen at railway station entrances and on trams and buses. Two hour tickets are available from all the machines. Two hour, daily and weekly tickets are available from machines at railway stations and milkbars and newsagents who advertise that they sell Met tickets. The city centre and inner suburbs are in zone 1, intermediate suburbs in zone 2 and outer suburbs in zone 3. An adult daily zone 1 ticket costs about $5. This is excellent value for doing hop on hop off sightseeing. Weekday daytime services are once every twenty minutes at worst. Saturday services are once every half hour at worst. Sunday services can be as bad as once an hour for trains and buses and once every half hour for trams. After midnight services are non-existent except Nightrider buses that operate in the early hours of Sunday and Monday mornings leaving hourly from Swanston Street in the city from 12.30am. Some private buses do not operate on Saturday afternoon or Sundays. A hire car is not necessary for looking around inner Melbourne. Traffic may make driving slower than catching public transport especially if you have to find a parking spot in the city. There are parking stations but they cost up to $10/hr. A hire car or organised tour is however advisable to visit the countryside beyond Melbourne, such as Mount Dandenong and the Great Ocean Road because public transport does not operate or operates only irregularly. Avis, Hertz, Thrifty and Delta Europcar all have offices at Melbourne's Tullamarine airport but there is an extra charge to pick up and drop off a hire car at the airport. There is a concentration of hire car companies on and around Franklin Streets near the corner of Elizabeth Street in the city including all the big hire car companies and some smaller ones. Historic Gold Rush Towns of Ballarat (100km west) and Bendigo (115km northeast). Australia's cool but scenic island state with well preserved old colonial atmosphere. directly through the historic gold mining town of Ballarat and the Grampians National Park. via the coast stopping at Wilson's Promontory National Park and numerous cool weather coastal fishing towns in southern New South Wales. Travel north-west to Mildura via Bendigo. Copyright © 2005 Graham Warren. Backpackers Guide to Australia (TM) is a trademark.